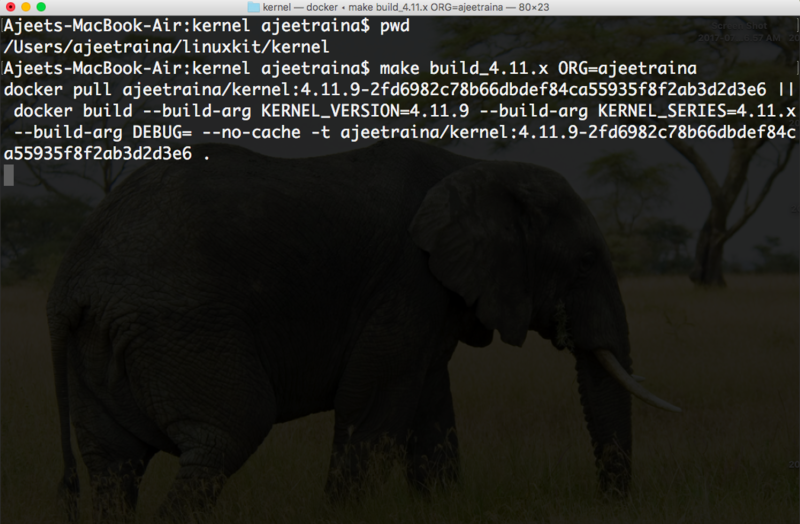 Walkthrough: How to build your own customised LinuxKit kernel? The Moby Project is gaining momentum day by day. 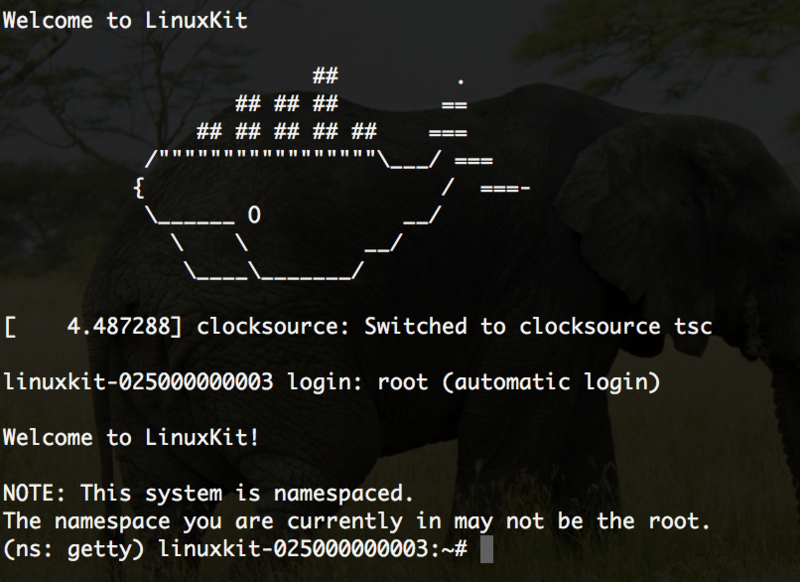 If you are System Builder looking out for building your own container based systems, Moby is for you. You have freedom to choose from the library of components derived from Docker or you can elect to “bring your own components” packaged as containers with mix-&match options among all of the components to create your own customised container system. 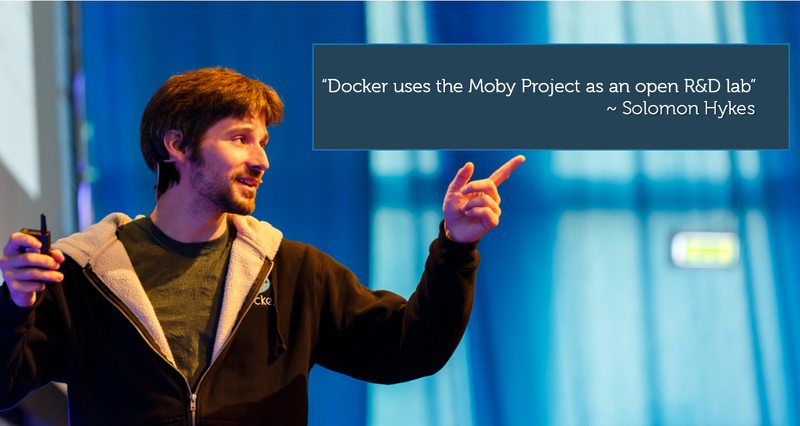 Moby as a tool promises to convert Docker from a monolithic engine into a toolkit of reusable components and these individual components results in the building blocks for custom solutions. I was a speaker at Docker Bangalore Meetup last weekend and talked about “Introduction to LinuxKit”. I walked through the need of LinuxKit for immutable infrastructure, platform it supports and finally demoed PWM(Play with Moby). I spent considerable amount of time talking about “How to Build Your Own LinuxKit OS” and showcased them how to build it using a single YAML file. One of the interesting question raised was – ” How shall I build Ubuntu or Debian based OS as our infrastructure runs most of these distributions?” I promised them to write a blog post which is easy to follow and help them build their own customised kernel with LinuxKit. A Brief about LinuxKit Kernel.. It contains the kernel, kernel modules, kernel config file, and optionally, kernel headers to compile kernel modules against. 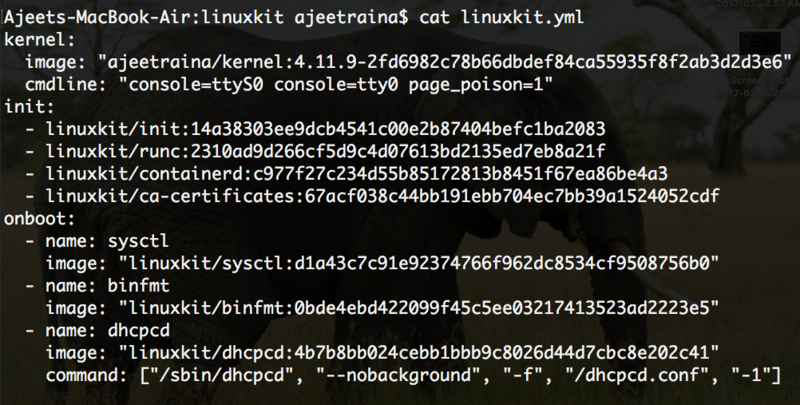 It is important to note that LinuxKit kernels are based on the latest stable releases.Each kernel image is tagged with the full kernel version (e.g.,linuxkit/kernel:4.10.x) and with the full kernel version plus the hash of the files it was created from. 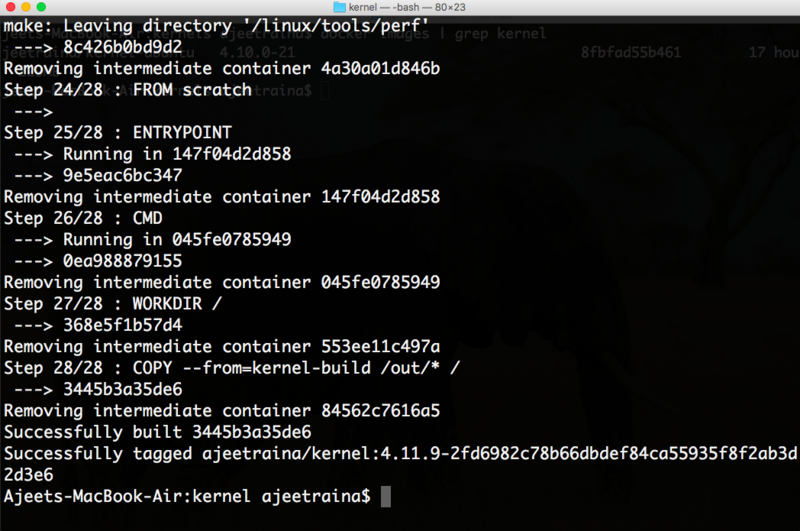 linuxkit/kernel-mainline: Mainline kernel.org kernels from the Ubuntu Mainline PPA. Moby uses YAML file as an input to build LinuxKit OS image. 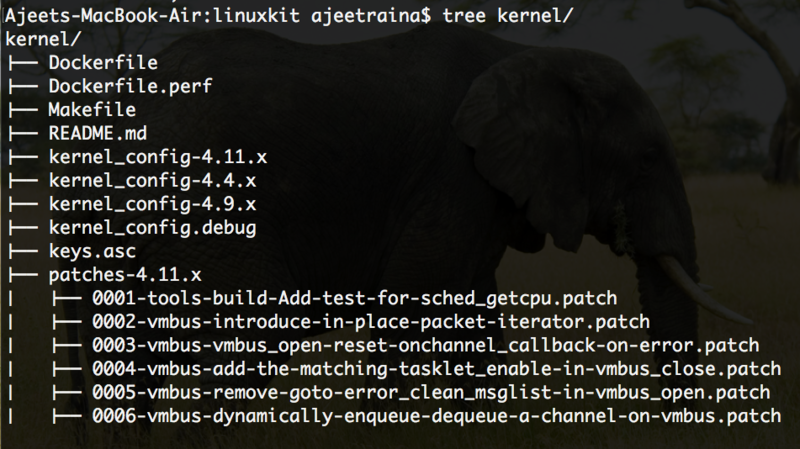 By default, the YAML file uses the default linuxkit/kernel:<version> as an official image as shown below in the first 3 lines. 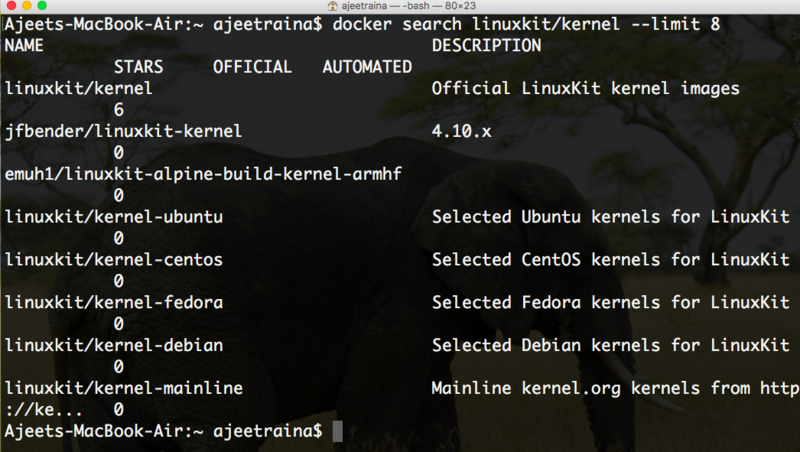 Under LinuxKit project repository, there is a kernel build directory and holds essential Dockerfile, configuration files and patches available to build your own Kernel for LinuxKit OS. Below is the snippet of kernel_config-4.11.x file. 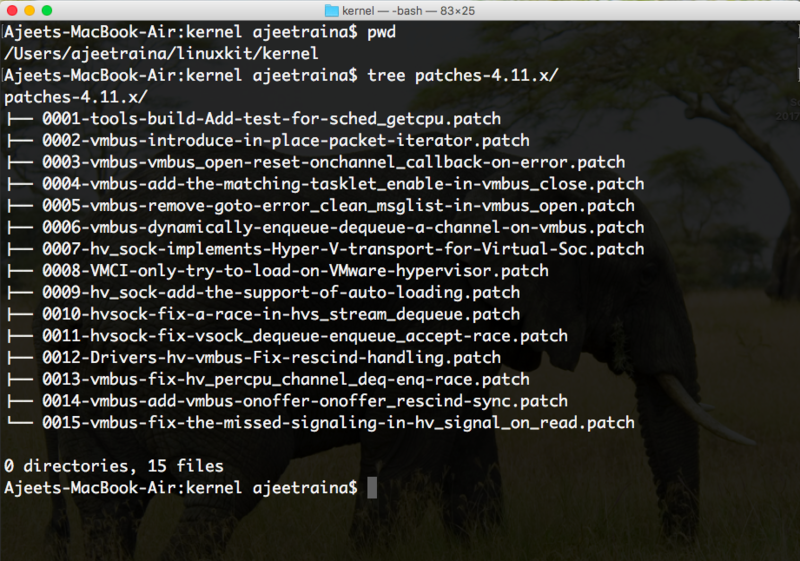 The few lines below shows that the new built kernel will be pushed to Dockerhub under ORG/kernel:<version>. PLEASE NOTE – ORG should be replaced by your Dockerhub ORG (it’s basically Dockerhub ID). If you are planning to raise PR for your patch to be included, you can use LinuxKit ORG and then get it approved. This will take sometime to create a local kernel image called ajeetraina/kernel:4.11.8-8bcfec8e1f86bab7a642082aa383696c182732f5 assuming you haven’t committed you local changes. 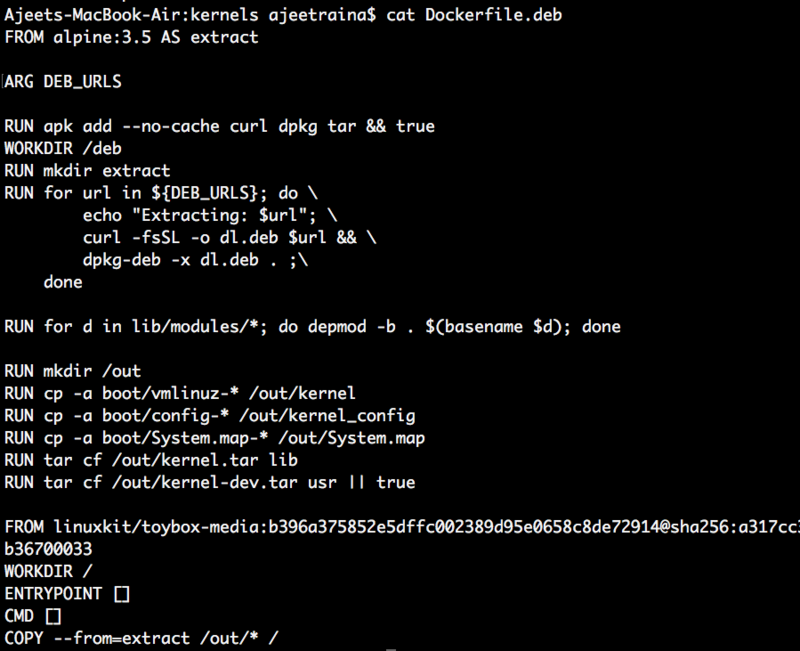 Let us pick up linuxkit/linuxkit.yml and add the above kernel entry to build LinuxKit OS running Docker containers as a service. 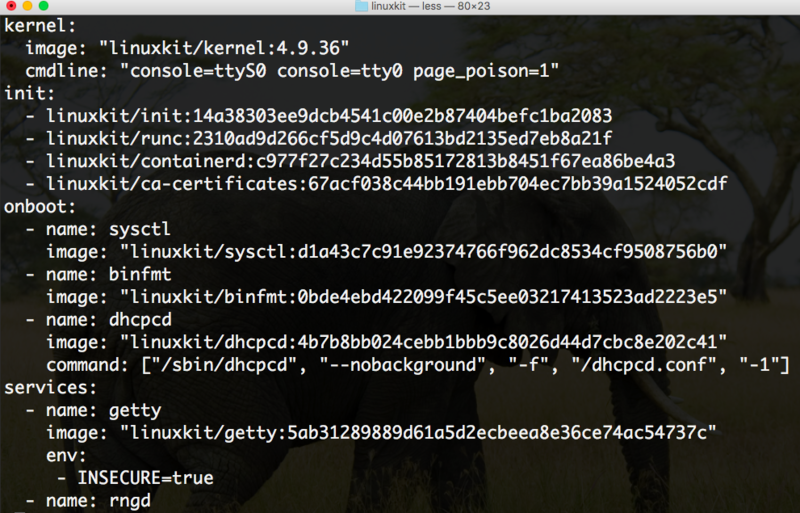 Next, execute the linuxkit run command to boot up LinuxKit.